An idea is worth nothing if it has no champion, but it is priceless when fortunate enough to have three. In 1978, with the support of Susan Ricketts and June Melenbacher, Joyce Langford’s idea and lifelong dream of a music festival in Barrie began to take shape. It was due to the efforts of these three women that the first music festival was held in Barrie, laying the groundwork for what has now become the Barrie Music Festival. Born not on impulse but through careful thought and nurtured by many, the inaugural Festival took place in 1979. Originally held for students of the Ontario Registered Music Teachers Association (ORMTA), thirty‐three participants took part in this single day event, then known as the Barrie Music Scholarship Competitions. Unknown to Joyce at the time, the Festival would grow to surpass even her greatest expectations. By 1982, only three short years into its existence, the Festival had grown to include 200 participants performing over a three‐day period. In 1983 the First Annual Barrie Music Festival took place. The Festival continued to grow, so much so that by 1985 it was too large for the busy music teachers of ORMTA to handle. In 1987 Joyce Langford retired as Director of the Festival, passing on the torch into the hands of The Kiwanis Club “Golden K” to manage festival affairs. At that point, the Festival became known as The Barrie Kiwanis Music Festival. 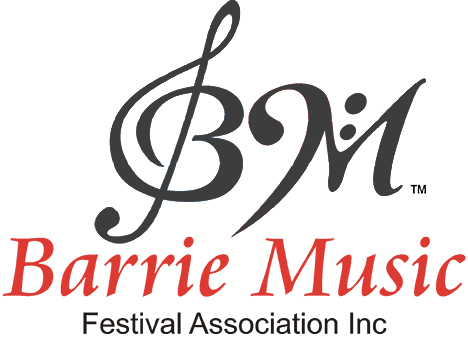 The Barrie Music Festival Association was formed in 1985, and was entrusted with overseeing the coordination and production of the Festival. As the Festival continued to grow year after year, it became too large even for the Golden ‘K’, and the responsibility for managing and running the Festival was ceded to the Board of the Barrie Music Festival Association. In 2014, the Barrie Kiwanis Music Festival’s name was changed to Barrie Music Festival, reflecting changes to the funding structure of the Festival. This Festival is now funded by a variety of local businesses, service clubs, and individual sponsors and is directed and operated through the community‐based Board of Directors of the Barrie Music Festival Association. The Festival’s mission has always remained clearly defined, recognizing the diversities and importance of music and culture within our community. As with the essence of music itself, the Barrie Music Festival has taken on a life of its own and is now a standard annual event in many students’ calendars. It lasts for 3 weeks and encompasses a wide range of disciplines from classical voice to garage bands and beyond. The tireless efforts of the three women with a dream will always be remembered, and our future is secure with the priceless efforts of many who share the same dream and love of music.